Gingival enlargement is a commonly encountered problem in clinical practice. The treatment of choice is gingivectomy. The wound healing takes place by secondary intention and is associated with significant patient morbidity during the healing period. Newer techniques like the use of laser can be employed to enhance patient comfort during procedure and better healing of the gingivectomy sites. Laser use is beneficial as it requires minimal anaesthesia, lesser surgical time and good post-operative healing. The ultimate goal of periodontal therapy is to re-establish anatomical and physiological conditions conducive to long-term health and function of the periodontium. An understanding of the healing pattern of periodontal tissues maybe valuable in the treatment of periodontal disease. Gingival hyperplasia is a common clinical finding and is related to a variety of etiologic factors and pathogenic processes (e.g., dental plaque, mouth breathing, hormonal imbalance, medications etc.). Gingivectomy is a procedure employed to eliminate the pseudopockets seen in the enlarged gingiva. The procedure is employed to remove the diseased tissue, to improve the esthetics, for prosthetic and orthodontic purposes and to reduce the probing pocket depth of periodontal pockets. The wound healing is a slow process following gingivectomy and takes place by secondary intention; it takes a few weeks to establish the normal contour of the gingiva. Owing to the slow wound healing several methods such as topical application of medicaments, antibiotics, or amino acids have been tried to improve the healing by secondary intention. Furthermore, techniques that cause lesser tissue damage would allow the wound heal quickly and uneventfully. Gingivectomy using lasers may prove to be beneficial to the patient as decreases patient morbidity and results in faster healing as compared to the conventional technique. With this background in view, the following study was conducted to evaluate the postgingivectomy healing in scalpel and laser-treated surgical wounds. 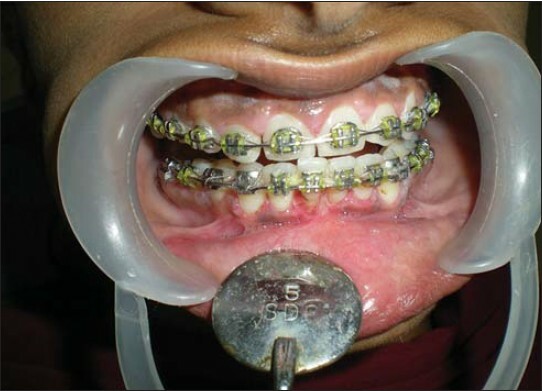 A 16-year-old female patient, undergoing orthodontic treatment reported to the Department of Periodontics, Babu Banarasi Das College of Dental Sciences, Lucknow, Uttar Pradesh, India with localized gingival enlargement in the upper and lower anterior region. 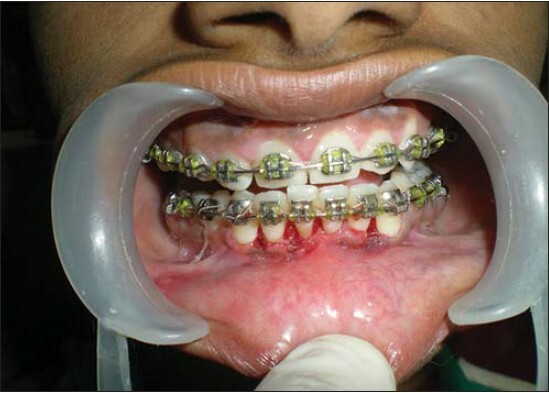 Gingivectomy had been planned for the patient to involve the lower anterior teeth [Figure 1]. In order to compare the healing following treatment, it was decided to treat tooth no. 31-33 using the conventional scalpel technique and teeth 41-43 using a diode laser. Presurgical preparation consisted of scaling, oral hygiene instructions, and dietary evaluation and blood investigations. A written informed consent was obtained from the patient and this study was approved by the Institutional Ethical Committee. Following local infiltration of the tissue a conventional gingivectomy procedure was performed on teeth 31-33 using a scalpel excising the soft tissue wall to the base of the pocket. Teeth 41-44 were lased with a diode laser 940 nm (ezlase) excision mode 3 W, pulsed contact mode, pulse interval and length 0.1 ms, scanning an area of about 1 cm 2 , while holding the delivery tip perpendicular to the tissue surface. The control sites were masked of the effect of laser by placing wet cotton over the surface [Figure 2]. After the procedure, all surgical sites were covered with a periodontal dressing (Coe-Pak). The periodontal dressings were replaced at 24 h and day 4. Postoperative instructions were given and patient was asked to monitor the pain response. The patient was asked to assess the overall pain experience and on either of the operated sites based on the McGills pain questionnaire reported more discomfort on the scalpel treated site as compared to the lased site. Three periodontists who were blinded as to test versus control sites were asked to assess the clinical parameters. The surgical sites were evaluated for the following: Tissue color (red, pink or bluish); tissue contour (normal, hyperplastic, or atrophic); and clinical status of the healing wound for the specific time interval (normal, better than normal, worse than normal). Score +1: Indicating superior healing of laser-treated wounds compared to control sites. Score 0: Indicating that laser-treated test sites and control sites exhibited the same degree of healing response. Score −1: Indicating that control exhibited superior healing when compared to laser-treated test sites. To confirm the clinical evaluation, the wound healing in the two surgical sites was assessed histologically. The tissue excised during the gingivectomy procedure was evaluated histologically to see the tissue reaction following the two treatment modalities. A second biopsy was taken 7 days after the surgery to assess the wound healing in the two surgical sites [Figure 4]. 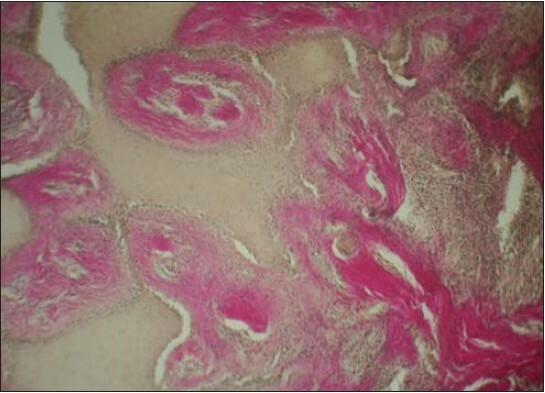 The scalpel biopsy section on Von Giesen staining revealed dense fibrous connective tissue stroma covered by stratified squamous epithelium [Figure 5], whereas the laser biopsy specimen showed necrotic epithelium with no clear demarcation between the various layers [Figure 6]. The observations suggesting that the lasers act by means of local necrosis of the tissue. 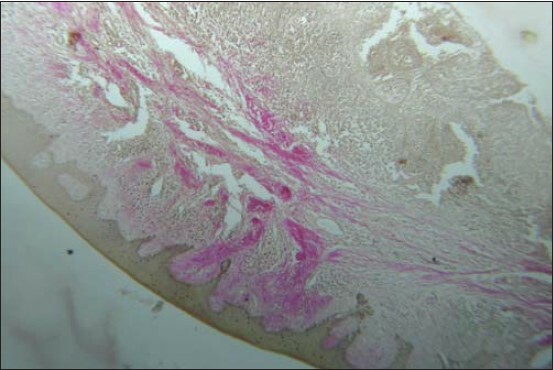 To assess the healing response in the two surgical sites second biopsies obtained from interdental tissue revealed moderately fibrous connective tissue with dense inflammatory infiltrate in the scalpel wound [Figure 7]. 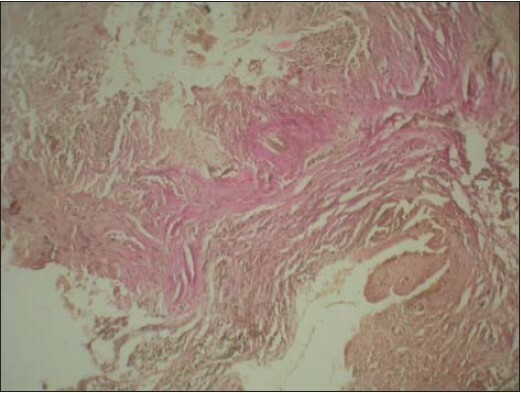 The laser biopsy showed densely fibrous connective tissue with fewer inflammatory cells and re-epithelization could be more clearly visualized [Figure 8]; suggestive of better healing histologically. Latest technological advances have led to a constant desire to develop new approaches for the treatment of periodontal diseases. The objective is to restore biological compatibility with treatment protocols that have least morbid effects on the tissue. Unique noninvasive procedures have been developed that improve surgical procedures and have minimal patient discomfort. Laser treatment is a unique noninvasive approach that offers infection control, precision surgical technique and encouraging postoperative benefits. Healing of periodontal tissue after surgical treatment has long been a subject of study. Several techniques have been employed in the past that improve the rate and quality of wound healing. Treatment using soft tissue lasers has dramatically improved surgical technique and wound healing as has been demonstrated in several studies. Therefore, in this clinical trial, postgingivectomy wounds were assessed over a number of days to clarify whether laser treatment could improve the healing process and postsurgical results [Figure 9]. Gingivectomy procedure was performed in the mandibular anterior teeth. Half of the teeth were treated using scalpel and the other half were lased. During the surgical procedure profuse bleeding was observed in the scalpel treated site, whereas the laser site was relatively blood-less. The tissue sections obtained during gingivectomy were sent for histological analysis. A repeat tissue sample was obtained on the 7 th day during the healing phase to analyze the changes occurring during the healing phase. 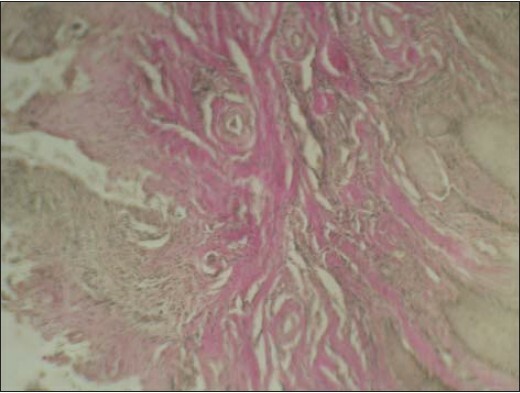 Baseline specimens revealed dense fibrous connective tissue stroma covered by stratified squamous epithelium, whereas the laser biopsy specimen showed necrotic epithelium and haphazardly arranged matrix components. In the follow-up biopsy it was observed that scalpel wounds had dense inflammatory infiltrate and moderate amount of fibers, whereas laser-treated site had fewer inflammatory cells and much improved epithelization. Although the results of laser application for gingivectomy appear favorable more in-depth evaluation of the mechanism of healing in larger samples is required so that lasers may be judiciously used in several periodontal procedures allowing better results with minimum patient morbidity. There are certain limitations in the use of lasers for gingivectomy like excessive heating of the tissue due to charring, cemental burns result when the laser tip comes in contact with the tooth; also laser procurement is costlier when compared to other modalities. The result of this study encourages the use of low level laser therapy as an effective treatment modality in the treatment of gingival enlargement. In light of the beneficial effects of lasers, it can also be used for other periodontal surgeries as well. However, case selection and risk-benefit ratio is paramount before employing lasers for all kinds of periodontal procedures an adjuvant element for periodontal surgeries. A better understanding of radiation biology will help us implement the science in an optimum way. 1. Mariotti A. Dental plaque-induced gingival diseases. Ann Periodontol 1999;4:7-19. 2. Ramfjord SP, Ash MM Jr. 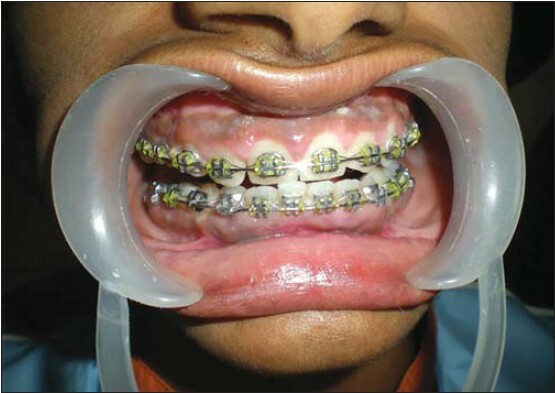 Significance of occlusion in the etiology and treatment of early, moderate, and advanced periodontitis. J Periodontol 1981;52:511-7. 3. Deðim Z, Celebi N, Sayan H, Babül A, Erdoðan D, Take G. An investigation on skin wound healing in mice with a taurine-chitosan gel formulation. Amino Acids 2002;22:187-98. 4. Buchelt M, Kutschera HP, Katterschafka T, Kiss H, Lang S, Beer R, et al. Erb:YAG and Hol:YAG laser osteotomy: The effect of laser ablation on bone healing. Lasers Surg Med 1994;15:373-81. 5. Pourzarandian A, Watanabe H, Ruwanpura SM, Aoki A, Ishikawa I. Effect of low-level Er: YAG laser irradiation on cultured human gingival fibroblasts. J Periodontol 2005;76:187-93. 6. Damante CA, Greghi SL, Sant'Ana AC, Passanezi E, Taga R. Histomorphometric study of the healing of human oral mucosa after gingivoplasty and low-level laser therapy. Lasers Surg Med 2004;35:377-84. 7. Amorim JC, de Sousa GR, de Barros Silveira L, Prates RA, Pinotti M, Ribeiro MS. Clinical study of the gingiva healing after gingivectomy and low-level laser therapy. Photomed Laser Surg 2006;24:588-94. 8. Masse JF, Landry RG, Rochette C, Dufour L, Morency R, D'Aoust P. Effectiveness of soft laser treatment in periodontal surgery. Int Dent J 1993;43:121-7. 9. Romanos G, Nentwig GH. Diode laser (980 nm) in oral and maxillofacial surgical procedures: Clinical observations based on clinical applications. J Clin Laser Med Surg 1999;17:193-7. 10. Luomanen M, Meurman JH, Lehto VP. Extracellular matrix in healing CO 2 laser incision wound. J Oral Pathol 1987;16:322-31. 11. Saperia D, Glassberg E, Lyons RF, Abergel RP, Baneux P, Castel JC, et al. Demonstration of elevated type I and type III procollagen mRNA levels in cutaneous wounds treated with helium-neon laser. Proposed mechanism for enhanced wound healing. Biochem Biophys Res Commun 1986;138:1123-8. 12. Karu T. Primary and secondary mechanisms of action of visible to near-IR radiation on cells. J Photochem Photobiol B 1999;49:1-17.